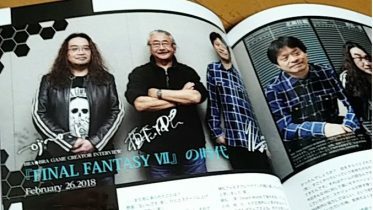 The following interview is featured in the Dirge of Cerberus Official Complete Guide and was translated from Japanese by Souya. The guide was published on February 17, 2006. Please tell us what is involved through the course of making Vincent the main character in this game. Kitase: I really like the original characters of FF7, and his name always made a presence in my mind. And this time, since we were thinking about wanting to make a gun action game, we decided on Vincent, who uses guns as his weapon of choice. Nomura: I heard it from Kitase that he wanted to make a FPS (First Person Shooting) game, and that he wanted to use characters from the past FF series. And though within those characters in the past FF series, there were many suitable candidates; I have in mind that Vincent is the most suitable out of all of them, so I suggested it as well. There were others like Yuna, Barret, Irvine, basically, we’ve thought about all the past FF characters who used guns as their weapon of choice. However, with the release timing of AC and BC, as well as the mass depth and mysteries that are being covered [in AC and BC], it would be great if we can use Vincent as a way to smoothen [elaborate] the plot; and that’s what we thought about and it came true. The genre that is called FPS, is not a really common thing [system] to the Japanese gamers. So during the development of this game, are there any uncertainties that are in mind? Nakazato: When we made our press conference during the Square-Enix party, people who got to come into contact with this product were shocked. We realized [have in mind] that there were people who mainly play KH type genre of RPG, and the way they finish off an enemy is by approaching them up front to attack. However, in FPS, you can’t just run up to the enemy and assault them. So bearing in mind this experience, we realized the concept of FPS is not very well instilled in most gamers’ mind. Since we have this issue, we figured that we should include a Easy mode for people who just play pure RPG to understand and manage through this game. Kitase: And to balance it out with the issue mentioned [by Nakazato], there was a dispute in terms of where the focal point should be, until the very end [of the production]. We didn’t want to make it into a first person POV, so we decided that at least we have to see Vincent from waist above, and able to see somewhere from his shoulders when the camera rotates. Though it is better if we want to make it like a real FPS and have the camera set around the height of the shoulders, there are still people who are new to the whole FPS concept and it is better to give them a full character view so that they can control the character easier. Moreover, when and how characters should be seen, and how it must not be seen on the screen, in certain instances, is quite difficult to manipulate. Nakazato: Yes, to obtain a balance in that area was hard. Especially we don’t even know who is standing next to Vincent, and with considerable trouble [effort] about Vincent moving around, we have to make him look fascinating. And because we wanted to see it, so we added visual effects along with the mantle. This is about Vincent’s mantle. It seems that it’s the same mantle that is seen on Grimoire. What is the origin/concept of this mantle? Nomura: When I was asked to make a conceptual drawing about Grimoire Valentine, I was only then told on the spot that he is the father of Vincent, which made me quite shocked and surprised *laughs*. However, I am not exactly the person who is responsible for the making of Grimore Valentine [/I don’t have the final call]. Instead, it was Nakaaki, the sub character and mechanic designer who drew the general appearance of Grimoire; but since [we have different styles] the look [on the face] is far different than Vincent’s, so Grimoire’s facial detail had to be redrawn by me. About his clothing, it’s basically what Kitase have said [so I won’t repeat the same speech again]. The gun that Vincent uses is quite impressive and striking. Are there any specific designs or origins about Vincent’s gun, Cerberus? Kitase: After all, since this is a Gun Action game, the gun he’s holding must be special in a way. Bearing that in mind, we decided that it should be somewhat different than the previous productions. Mr. Nomura, you are the one that is in charge of all the main character designs. Is there anything that you have to especially keep in mind? 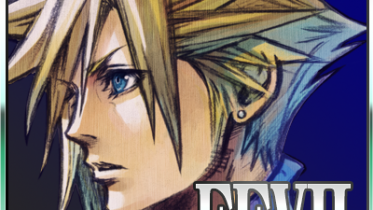 Nomura: This time, I kept in mind that I have to draw a lot of people that represent the world of FF7. Therefore, I can’t just go and say, “I feel that this character should be like THIS!”, I have to consider the many factors these characters have on each other, whether or not they fit in together with each other. Though there are times that I work with Nakaaki and other new designers in this project, in terms of female clothing, they are given to female designers. 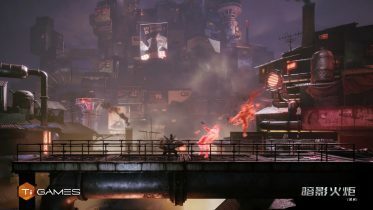 [It is said that the world of DC] seems to be much broader compared to the world of FF7. Nomura: Yes, it seems so. Nakaaki and other members who were involved used to be the test players of FF7 a long time ago. A little input from them might be interesting. Since this is a spin off, I don’t think there is any way that we can do so. So in a sense, can we say that Nomura is the one who does the design, while Nakaaki and the others put on the flesh and bones? Nomura: Perhaps so. Take Shalua as an example, she was first drawn by Nakaaki, then it was given to female staff, and at the end of the process it was given to me and I added the finishing touch to it, so it’s basically a 3-step process. Is there a certain expectation you want to see for characters who appeared in FF7 [but weren’t really clearly shown back then in conceptual art]? Nomura: About Lucrecia, since the leftover [remaining] information for her in FF7 was not found, it was really hard to recreate her. So we relied on guidebooks’ tiny little portraits, and the many drawings that fans did of her. Then we look at Sephiroth, the son of Hojo and Lucrecia, of course he looks more like Lucrecia [than Hojo] *laughs*. Based on all these points, this is how we establish the current Lucrecia that you see in DC today. The crystal object that Lucrecia has been sleeping throughout DC, is it possible that she could be alive? Chiba: She is still alive. In FF7, she became an entity that possesses a body that won’t die [perish] “that easily,” so she was always inside the crystal. However, it is not to say that it is entirely impossible for her to come out of the crystal, as Lucrecia was just in a state of sealing herself inside. Furthermore, that crystal is a product of Lucrecia herself. However, those who have seen the ending will understand that words can be [properly] communicated to her. [Carried on from above] what exactly is the idea [strength] of this crystal? Was it based on the same principle for the coffin that Vincent slept in when he was in the Shinra mansion? Chiba: It is being protected [guarded] by something that is much stronger. Since Vincent just wakes up and open the lid *laughs*. About the character that “does not want to establish direct contact,” Reeve has this comment about this individual as “someone who wants to compensate for [the debt he owed to] the planet.” So is it possible that the person behind WRO’s funding is “him”? Chiba: I think it must be him *laughs*. Kitase: Since there is a similar dialogue that appeared in AC, please try to make a connection between that mysterious comment [and this one, the person (?)]. If there is really such a contributor as Reeve said, then Cid’s Airship units, after all are also funded by the same person? Chiba: In the case of Cid, to say that he received the money directly from that person is a bit…well it wouldn’t really make sense because of his [Cid’s] personality, but I think it’s more of passing the money from Reeve to Cid. 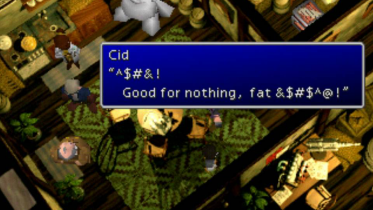 Whether or not Cid still has some [qualms (?)] about that person, it’s quite a delicate matter *laughs*. What is the contributor doing as of now? Kitase: Basically what he is doing in AC, and it’s going to extend for quite a while [meaning he will be doing the same thing in the future for quite a while]. For some reason or the other, since he still has this bad impression upon him, it is still not clear whether or not the reason of his support is [simply] just to help out. Nomura: No matter what is going against the planet and how he wants to compensate, I think he is trying to establish some sort of profit as his primary goal. Even in DC, he says it’s for the sake of amending his debt to the planet and helped out financially, but I think I’m afraid [it’s just another way] he used to put his own goal forward. Okay, the next question is, about the new characters, Tsviets, do they have a model that they are based on? Chiba: I was thinking, since Vincent being the main character this time, along with characters like Yuffie, Cait Sith, Cloud, et al. from FF7, they needed some people to fight against. Keeping in mind that they are soldiers who are different from Sephiroth, and making a balance out of here and there, we came up with Vice, Nero, Rosso, Azul, and Shelke, while Nomura designed and shaped them. Nomura: About Nero, I was being told, “Restrict him [for me]”. As I am not responsible for writing the scenario and background information for the characters, I was very loose [on the details] on the design of the characters. Though I have also received information about Nero, when I saw that it has “suppressing his own strength therefore binding his own hands,” I started to have funny ideas, because right after that, it says, “shoots things with his two hands” *laughs*. Moreover, the information also has “riding on a motorcycle” written on it. Does Nero really ride on the motorcycle without his hands on the steering control? *laughs* And that caused me quite some trouble, so I decided to give him a pair of wings with hands on it. Why is it that Nero has to have his two arms restricted, not to mention that his face is being wrapped up with bandages? Chiba: Throughout the years while he was in DG, he got used to not using his hands, got used to being in control, got used to being locked up, got used to being restricted. About his bandages, that person [Nero], seems to be the type that will leave [leak] something [here I assume it’s his darkness] wherever he goes, so the image of him needing something to keep it [his power] blocked came to place *laughs*. We also had this idea earlier that Nero’s mother got trapped into darkness when Nero was born. Basically everyone in Tsviet received some form of “adjustment” in DG one way or another, but what exactly is the thing that everyone was subjected to, when you enter the multiplayer mode, you shall find out. In the Tsviet, everyone was given a name along with a color, why is it that Shelke is the only one labeled as “Colorless”? Is there some sort of meaning behind this? Chiba: This will become clear once people have played the multiplayer mode. If people have gone through halfway of the multiplayer mode, Shelke’s secret will be understood. Does Tsviet only consists of 5 people? Chiba: “What if there are people who survived?” That is something that we do not know. Since Tsviet is a name given to those people in DG who are ranked as Elites, and those 5 people who survived through the last three years [FF7 to DC] are exceptionally stronger than normal warriors. In multiplayer mode, players can become Tsviets too. It seems that Azul and Shalua made an appearance during BC. Is it possible that more DC characters are going to be seen in BC? Kitase: As BC is heading towards its better state [in terms of the plot], I doubt that there will be any more links [with BC and DC]. However, since this whole project is a “living thing” under development, it is uncertain what will become of it. This is about Weiss. Why is it that he was “sleeping” [throughout DC]? Chiba: Actually, after the unification of DG, Weiss’s whereabouts became unknown. Nero, who kept this information from the rest of the DG and continued on ruling and controlling the rest of the DGs. And after that, it’s the background story… of how he met up with Hojo. It seems that while Weiss is in a state of sleeping, it created a chance for Hojo, who is [supposed to be] dead to come into contact to him. Chiba: Weiss is basically a character that contains all the special abilities [good stuff] of the DG soldiers. That is why he is able to use SND as Shelke used hers, and that is also how Hojo caught hold of him and used him in reverse. Kitase: After Meteorfall, the Network that had been disrupted was restored by the time of DC. The Kalm Revival Festival could be described as a celebration symbolizing everything getting connected. And with the successful hook up of the network, this leads to the incident of Hojo. Nomura: In very early stages, we planned to have Weiss with cables stuck inside his body. And then draw him without wearing anything on his top half. We also planned to have these cables hooked up to a computer, which is used by Hojo. You could take it [think] that the Omega that was created when Nero and Weiss become one is because of Hojo when Nero was being distracted. Omega is born from the pure Lifestream, so does that mean the Omega we see in DC is completely different form than the original Omega [that was described in Lucrecia’s reports]? Chiba: It is a completely different object than the original Omega that was expected [to be born out of natural causes]. As a result of being a completely different object than its original form, you can also say that the way in which this artificial Omega was created [the reversal process] brings harm and devastation. After the incident, we can see that Shelke is living with Tifa and people leading an ordinary life. It appears that she does not have to rely on Mako baths anymore. If that is true, could we please hear about the reason behind this? Chiba: I was thinking if it could be her sister who might have been revived in the ending gave her the strength [to live on without Mako baths]. Kitase: When Omega was defeated, the thing [that resembles Mako-snow] that rained down was the Lifestream. It will be great if that person [Shalua] can wake up. What kind of life is Shelke going to lead after the game [in the future]? Nomura: I think she wants to be with Vincent. Though this is how it’s said, based on Vincent’s personality, I don’t think he will adhere [stay] with her. Even if she is unable to leave yet unable to stay, I feel that she will be in a relative distance around Vincent. Her look in ordinary clothing [the one she wears at the ending] is quite shocking [astonishing]. Nomura: I was thinking, “Am I going to use that ?” Although I was being told to draw the ordinary clothing, since I was thinking if it will be good to get something out during the scene of reminisce. Lastly, while having tea at 7th Heaven, although she came out [shrewdly] looking as a Soldier and said “Hey” [meaning she didn’t feel comfortable to wear the DG uniform in front of Cloud and people], it seems that at the end she wants to reserve it [DG clothing]. It is said that her clothing is based on a concept of “something cute”, is this true? Nomura: Nope, rather, I was aiming for the “ordinary girl” look, and I just followed that idea and drew. At the end, I just wanted to show that she returned to being someone who she really is. Please tell us the character(s) that you are fond of in DC. Nakazato: I like Azul [very much]. When Chiba was writing the scenario for me, to the stage where we decide on the voice actors, I felt that this is the way [the image] that Azul should be. Chiba: Since I am the key [as in the most important/critical person] to the making of the scenario, I have to say I like Shelke after all. In terms of her expression, the way her face is portrayed is in tremendous detail. “Move towards this way a little bit” and “This time stay like this”, they really did a rather fine job of making her. Nomura: It’s probably Rosso. Though we are speak of characters that are not originally in FF7, and there are also quite a few members in coming from Tsviet, Rosso is probably [of all the Tsviet] on quite a different line [level] when I drew it. I think Rosso is definitely one of the unique creations that I have out of all the characters I have drawn. Kitase: After all, I think Reeve was quite amusing *laughs*. In the first reunion [of Reeve and Vincent in DC], we didn’t think about making a human copy or anything interesting for him. Though we didn’t intend to have that scene in the script, I tried and said, “Let’s do it.” From then on, we have setup a character profile for him. Although it wasn’t an openhearted laugh [joke], we want to see a “Wow, this guy’s amusing” actions expressed by Reeve. 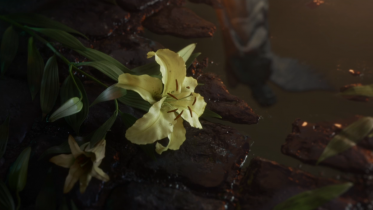 And since in the previous production [FF7] we weren’t sure what kind of person Reeve is, we imagined that he’s someone that doesn’t have a lot of people following [in contact with] him. Therefore, this time around, we revamped his position in DC. During the production of DC, we were also in the middle of AC’s production. When I heard Nomura ask, “Is Reeve going to make an appearance in AC?” I said, “Only his voice, but not himself.” And since I liked the idea, I did what I like [I went ahead and made it come true in DC]. And since the overall story of DC is quite heavy [serious], we thought about Yuffie and pondered if she can become a character for some comical relief. Please let us know what aims made you decide on collaborating with Gackt. Nakazato: Though we have a lot of candidates when we were deciding who we should get [to sing the theme song], at the end we wanted to aim for someone who can make a huge impact. Then we thought, “It would be great to have the person who sings this theme song match and represent the image of Dirge of Cerberus.” At the end it became a favor that we asked from Gackt. 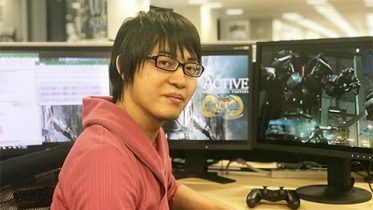 Nomura: Though that’s how it is for the songs, we have actually been thinking if he should do some voice acting on another compilation title. But since it couldn’t come true over there [the other compilation title], it became something like “Why don’t we try this on DC and have a theme song instead.” Although there are many female artists’ images that can represent the female characters of the FF series, after the talk about wanting to have a male artist, Gackt, who was one of the candidates, was being suggested. It became a thing which I feel is the most suitable towards the world setting of DC. Not only is he someone who [closely] sticks to my own world setting; to a certain extent in the world of FF7, it is also has a meaning of a thing that is being finished. Though it is not sure whether or not that side [Gackt] has experienced uncertainty, he accepted and agreed willingly [upon our request]. Not only responsible for singing the theme song, but also appearing in the FMV, are these all decided at the same time when [you made the decision to collaborate with Gackt]? Kitase: While we were going ahead and [making sure that we go along as we have planned earlier in the talk] trying to get Gackt to sing the theme song, and since he is going to appear in the promotion video as a character, we were thinking about having Gackt do some voice acting, “Wouldn’t it be interesting if we can hear his voice too?” The atmosphere of Gackt and our image of the characters in the FF series are quite similar, so I felt why don’t we let him make an appearance in the state as it is? We also considered [about how we will be able to make] this piece interesting if Gackt didn’t only make a voice contribution, but also appear in person. We heard Gackt also gave some suggestions on [G’s clothing] design. What kind of suggestions did he give? Kitase: For example, when Nomura was in the middle of designing the clothes, we were wondering if the coloring should be white or black, we also have many other variations in mind. But at the end, Gackt chose red. Nomura: In the beginning there were black, white, and red. Even though I say black, Kitase says white, we still decided that it’s better if we respect the wish of whatever the wearer’s choice is. Upon the completion of the design, is there such a thing like “I want to create something [with an image] like this”? Nomura: Since that costume was planned to have a theme of “One-wing,” according to the design, it will become a coat that has feathers wrapped around the patches [squares and tiles] section. It’s basically a design where the whole body is almost wrapped with feathers. [Could we say that] after we incorporated his [Gackt’s] ideas, it somehow became his design as well? And what is left is that, since it was not finished at the time, we just drew it as an unfinished design. Kitase: Though at the very beginning when the prototype of the clothing design was out, there were going to be black belts with the images of wing[s] hanging fully from the design, we listened to the ideas about the length and balance of the decorations given by Gackt, since he will be the one wearing this costume in action. There were many instances and things that happened when he tried to put the costume on but he couldn’t move. *laughs* And since this time, he will be appearing with a CG character at the same time, we’ve paid special attention to the design [overall impression] of how he looks afterward wearing the costume, so that we could make sure the head and body balance are the same for both Gackt and Vice [the CG character]. It feels that the theme song [Redemption] and [Longing] matches the theme [of DC] quite well. What kind of request was made to Gackt when he was composing these songs? Kitase: About the ending song, our request in the beginning was to make it a ballad. We knew that Gackt has a lot of wonderful ballads [amongst his songs], so when we first got together and talked it over, we requested the same type of ballad that Gackt has been doing. In the middle of the production, Gackt was saying [suggesting] aside, “How about making it sound like this?”, and that’s how Redemption came to be. Nomura: Since I have been thinking for a while to have a song as intensive as this, I passed it with no objection and accepted it. Chiba: I wanted to see [and bring out] the game scenario and game play no matter what, and when I saw Gackt’s image, I said to myself “This is it!” and that essentially became how I feel. Nakazato: Before Gackt [started on something], we sent him all the related information including the ending sequence to him, we asked him to compose a song that can express the things that happened in that scene. When we have to master-up [final touch up] this game, Gackt’s Live [the song] became extensively heavy [recording], and we didn’t have enough time to spare and play the scene all over again. However, as more staff personnel are moving over to the Hakata site, we [finally] get to have a chance to check over the whole video. I must say I loved the game. Great job. But I amcurious how you guys came up with the new chaos design?